In the first weeks of 2009 a St. Louis area 15 year old using the screen name Marcus_Qwertyus launched his career as a Wikipedian and new media influencer. In less than six weeks Marcus (aka, Mark William Schierbecker of Webster Groves, MO) entered more than 500 edits for Wikipedia articles working at a pace only a teenager with free time over winter break might maintain. In his first year this prolific social media participant made some 7,000 contributions to the Wikipedia online encyclopedia of stuff. By 2012 contributions for this now high school senior have risen to more than 25,000. His editing interests range in diversity of topics from hand grenades to mobile phones. He caught my attention because on August 22, 2011, Markus created the first entry for the current social media phenom Pinterest. 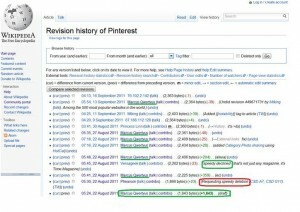 I wondered how the folks at Pinterest allowed a teenager the first shot at creating the most potentially influential description of their brand and product offering online – a full year after they launched their product in 2010 and a week after Time Magazine listed them in an article about the 50 best websites of 2011. Anyone who follows social media had to anticipate their brand would be the focus of interest online by the Wikipedia community. Our youthful Wikipedian clearly got on Pinterest’s radar quickly. 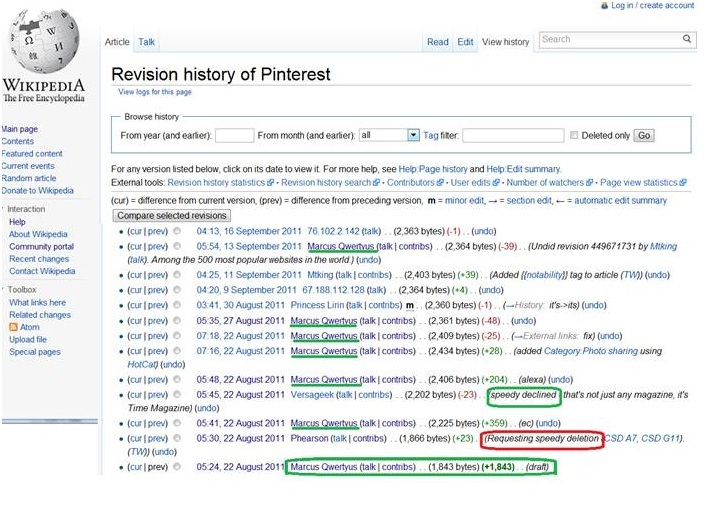 Early contributor tracking for Pinterest’s new Wikipedia profile page reveals that an editor who offers to help brands online immediately petitioned to have the teen-created profile page deleted; however, our prolific Show-Me state editor responded. Armed with effective use of Wikipedia community standards and tactics and enlisting the support of other community editors, his definition-setting article for this now emerging social networking powerhouse new media brand stands today. While our teen editor Markus continues to be the major watchdog and influencer over edits to this page, the now well-massaged profile for Pinterest. with scores of edits and revisions, is likely not a problem for the brand and its backers. What’s most intriguing is how savvy Internet entrepreneurs with well versed new media financial backers missed an opportunity to define who they were first and at this critical early stage of their brand development. Getting into Time Magazine and the buzz that was generating around Pinterest clearly suggests they had access to professional marketing and public relations support – this support apparently put some social media influence behind that of other traditional outreach in their plans. We frequently come across organization brands which meet the qualifications for inclusion in Wikipedia, but whose management still aren’t sure about venturing into social media to engage and help define themselves. Wikipedia engagement remains highly elusive and fraught with perils for most. Executives are often wary of spaces where 15 year olds can yield equal or greater power over their names. Community standards and engagement practices create challenges for traditional public relations and marketing professionals, but the influence of Wikipedia dictates that we surmount those challenges and embrace the opportunities therein. An organization’s profile and references within Wikipedia, should they be created and maintained, will be found when people search for your brand and form opinions about you. What’s included in this information will be cited and sourced in other discussion threads. It will frequently serve as a starting point for journalists, analysts and other key influential stakeholders linked to your organization’s interests. The first to move and create a profile sets the tone and framework for how others in Wikipedia will engage around your brand. While you cannot own your brand on Wikipedia, leaving how it appears to fate and the whims of others, be they a savvy teen, critical activist or competitor, would be a gaping hole in any online brand and reputation management plan. Executives or investors who are surprised and have to react when someone else defines your interests online, be it in Wikipedia or other influential social platforms, should reevaluate the sources of their marketing and public affairs counsel. Jay Byrne is president of v-Fluence Interactive, an agency offering digital research and strategic communication support for online reputation and issues management. v-Fluence provides clients with customized brand and product research, white papers, best practice guidelines and execution support for engagement across new media platforms.